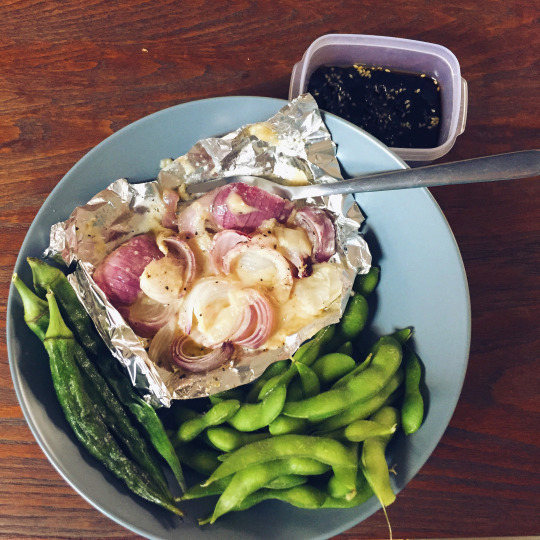 How to be a Herbivore in SG Part 3 – How to cook? Previous: 01 why vegan . 02 nutrition . Next: 04 groceries . 05 social eating . 06 eating at hawker centres . 07 challenges and support . You may realise that it will be harder to meet your nutritional needs if you almost always eat out. Making food gives you full control and more access to nutrients at a cheaper price. Keep in mind that 1) I am not a medical/nutritional professional, always consult one if unsure AND 2) advice here may not work for everyone, as we are all unique individuals with different needs. – Rice, bread, pasta, rice noodles, wheat noodles, starchy plants (potato, pumpkin, sweet potato). Not all carbs are bad. If you blanket ban yourself (unless on doctor’s orders), you’re missing out the nutrients in good carbs that are vital to function well. Unrefined carbs are the better choice. Less white and more brown! – Any bean, nuts, seeds and gluten (seitan/面筋) foods. – Any fruits, green veggies, non-green veggies, root veggies, sea veggies and mushrooms. Important to eat your colours! And, fruits SHOULD NOT be equated with refined sugar. The way to eat less sugar, is simply eat less sweet foods with ADDED sugar. – First press plant oils (Extra virgin cold pressed olive/coconut oil), avocados, coconut milk, nuts, nut butters and seeds. A small amount is enough. Choose a whole food over processed oil whenever possible. Here, brown rice noodles makes the carbs, mushrooms and veggies gives vitamins and tempeh is the protein source. Drinks – non-dairy smoothies, soymilk (Silk Chocolate and Natura vanilla are my favs), nut milks, oat milk (Oatly Chocolate IS AMAZING), juices (go for freshly juiced ones instead of bottled), tea and coffee with non-dairy creamers (most coffee places have soymilk option), non-dairy bubble teas (pearls and jellies are made from tapioca and agar). I enjoy junk foods 20% of the time – like this ice cream from Mr Bean. Many supermarkets have vegan snacks like these daifuku, adzuku ice cream, mikan juice and soy red tea from Jmart. You don’t have to cook well to eat well. Firstly, cooking is a common sense understanding of 1) how long to heat things (hard ingredients = longer time) and 2) what foods goes with what flavours (blueberries might not work in miso soup right?). Little washing & peeling needed – Rinse with baking soda to remove pesticides. Plants like mushrooms, cucumbers, french beans, tomatoes, most fruits that’s got no skin or edible skin, no roots, visible sand and mud need minimal preparations! No cutting involved – Soft or crisp veggies (bak choy, spinach, broccoli etc), tofu, beancurd skin can be broken into smaller pieces by hand. No knife and chopping board to wash up! Ready-to-cook – Can be used immediately after removing from packaging. Frozen edamame, frozen veggies, sprouts (alfalfa, wasabi, broccoli sprouts), canned beans, dried seaweed sheets, pickles, plant milks and condiments are completely fuss-free. Dried legumes firstly need to be soaked for shorter cooking times, less digestive trouble and more nutrition. Canned ones are more costly and less fresh. Soaking can take a few hours to overnight depending on variety and soaking water MUST be discarded. Cooking times vary too. Here’s a detailed guide to cooking legumes commonly found in Singapore and detailed steps using pressure cooker and recipe ideas. The cooking water can be used as soup stock – just add salt and spices. Dried mushrooms and hard seaweeds like kelp, need to be softened before cooking. Wash and soak for at least half hour with warm water, remove mushroom stalks then wash again in case there is sand. Don’t throw away the soaking liquid – use as a vegetable stock. For softer seaweeds like wakame, washing once is usually enough to soften it for cooking. Starchy plants (potatoes, yam, pumpkin, sweet potatoes etc) takes time to be cooked. Duration varies depending on heating method, variety, size of cut, and temperature. Steaming with skin is the fastest and healthiest way. To check for doneness, poke the centre with fork or chopstick. If it sinks in or cuts easily, its done. Food prep is preparing ingredients in advance to make your daily cooking faster and easier. Take a couple hours on weekends for food prep to reduce weekday stress. Wash in bulk: Wash veggies/fruits and portion them into containers or bags. Can also be frozen and thus kept for long. Soft leafy greens and mushrooms can spoil if refrigerated after washing so freeze instead. Boil then freeze: For hard-to-cook foods like starches and legumes, cook in bulk. Portion and freeze them, taking some out whenever needed. Cooked grains, starches and noodles can be refrigerated (up to 2 – 4 days max) or frozen (for months). If freezing, separating into individual portions in bags or boxes is a MUST. Buy frozen: Ready to use, no washing and cutting needed. Frozen edamame and the classic corn peas carrots are found in most local supermarkets. Larger supermarkets might carry frozen broccoli, spinach and smoothie fruit packs, yum! Preserve and pickle: Make a huge bulk of fermented or pickled veggies so there’s a tasty raw side dish during the week. They can keep for weeks in the fridge too. Cut and portion: Unlike veggies and fruits which oxidize after cutting, proteins like tofu, tempeh can be cut in advance without much nutrient loss. Separate large blocks into smaller cubes and refrigerate or freeze them. Frozen firm tofu has a great texture and absorbs sauces better. For more flavour, marinate in different sauces then bake or saute. Everything is made in a single pot. Minimal smoke is produced which keeps the kitchen clean too. Refer to my guide written last year to making Asian one-pots focusing on pantry basics, flavours and textures and cooking times. One-pot porridge: Carbs – Sweet potato, rice. Protein: Braised navy beans. Vitamins: Cherry tomatoes, spring onions. If you have no access to a stove, a mini electric cooker is a great idea. Small size, affordable, easy to clean AND it can boil and steam at the same time. I used to use it in office everyday to make one-pot lunches, steamed veggies and buns. If you don’t have a stove or electric cooker, fret not. As long as you have any source of heat, you can make a decent hot meal. ONLY use glass and plastics labeled microwave safe to heat food. DO NOT USE METAL. Gluten foods (pizza, breads, buns) can dry out and harden while reheating. Add about 1 teaspoon water per piece into the container during cooking. They can do much more than reheating breads. Note that I’m referring to toaster OVEN not toaster for bread slices. In my house it even replaced the microwave completely. I treat it like a junior oven that can be used like an oven except for roasting starchy plants and baking. Always line the tray with aluminum foil or use a stainless steel plate. Don’t heat food directly on the oven tray as it will permanently be stained. I don’t recommend parchment paper. The heat source is close to the paper and that might burn it and become a fire hazard. Exercise common sense and wear kitchen gloves while removing the tray after heating. It’s HOT! Preheating will help to shorten cooking times. Before starting your meal preparation, turn the time dial and let it run. Toasted mushrooms & veggies: Simply wash them and mix in a bowl with 1 tsp oil + ½ tsp salt + any spice. Toast for 10-15mins until soft and juicy. Made this for a colleague last time. Onions with black pepper and Sheese, lady fingers and edamame heated for 15 mins. Most plants can be toasted, as long as they are soft, crisp, not hard like raw potatoes and broken into smaller pieces. Toasted garlic tempeh: Crumble or cut a block of tempeh into small pieces, mix with 2 tsp oil + ½ tsp salt + crushed or sliced garlic. Toast for 10 mins until lightly browned. Sambal tempeh: Cut a block of tempeh into bite sized pieces, mix with 2 tsp oil + 1tbsp vegan sambal + juice from 1 lime. Toast for 10-12 mins until juicy and fragrant. Pizza toast: Coat 2 slices of bread lightly in oil and place on aluminium foil lined tray. Spread any sauce, add sliced veggies/proteins of your choice, top evenly with crumbled vegan cheese and sprinkle with spices. Toast for 15-20 mins or until cheese melts. Used to make these in the office toaster oven for colleagues. 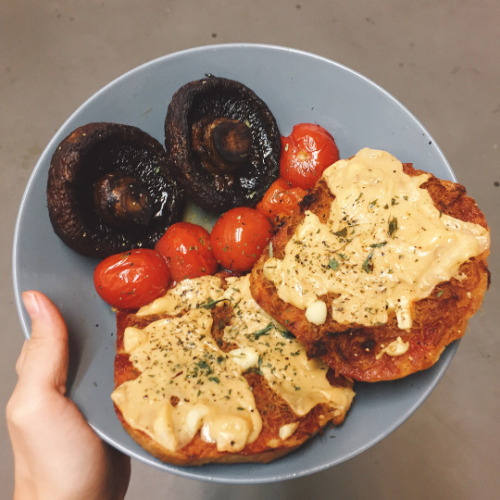 Mushroom floss pizza toast with cherry tomatoes and portobellos, sprinkled with crushed toasted laksa leaves. Fresh herbs, when toasted without oil, become very aromatic and crisp, making them an excellent topping. “Fried” rice/noodles: Mix a bowl of cooked rice/noodles with ½ tsp salt, 1 tsp oil, any preferred spice, sauce and finely chopped veggies and proteins of your choice. Toast for 10-15min until the centre is hot (check by either touch or taste). Great way to clean up leftovers! This is inspired by instant noodles and much more wholesome. Simply add boiling water to cover all ingredients, put a lid on and wait 5-10 minutes till everything softens. This is extremely useful when traveling. Carbs: Thin non-wheat noodles (bee hoon or tung hoon), quick cook wheat noodles (快熟面), cooked rice and grains, instant oatmeal. Proteins: Tofu, tempeh, seitan, pre-cooked legumes, ready-to-eat beancurd snacks (from Chinese vegetarian groceries). Veggies: Green leafy veggies (usually stems may be too tough to be cooked thoroughly), thinly sliced crisp veggies (tomatoes, cucumbers, carrots, bell peppers etc), freeze-dried veggies, kimchi (or any other pickled/fermented veggie). Mushrooms and seaweeds: Ready-to-eat dried mushrooms snacks (from Chinese vegetarian groceries and Japanese shops), fresh enoki mushroom, seaweed snacks. Condiments and seasonings: Any savoury sauce (soy sauce, chilli sauce, pasta sauce), fermented beancurd, miso, powdered spices, spice mixes, vegan MSG-free seasoning powder, nutritional yeast. Toppings: Toasted nuts, dried roasted seaweed, vegan soy floss (from Chinese vegetarian groceries, chopped herbs (chives, parsley, coriander), deep-fried onion (炸葱头), preserved veggies (like chye poh or achar). 1 – Cooked rice and green beans with sliced tomatoes, flaxseed powder, chopped cilantro, himalayan salt, white pepper powder. 2 – Brown rice noodles with steamed sweet potato chunks, silken tofu cubes, bok choy leaves, lemon slice, curry powder mix and himalayan salt. 3 – Dried kway chap (flat rice noodle) with baked tempeh, frozen sweet corn, dill, sliced green chilli, fermented beancurd and white pepper powder. 4 – White rice vermicelli with cherry tomatoes, sautéed tempeh crumbles, goji berries, sliced green chillis, frozen sweet corn, white pepper powder, black pepper powder, ginger powder and himalayan salt. 5 – Green bean vermicelli with cherry tomatoes, sauteed tempeh, toasted pumpkin seeds, dill, ground black pepper, ginger powder and miso. 6 – Brown rice noodles with boiled chickpeas, carrot, toasted tempeh bits, spicy red beancurd (nam yee) and chopped spring onions. Since no high heat is used, nutrients in the plants are well retained. However it will be less tasty than cooking with oil and high heat. So flavour needs to come from the soup base – mix and match fermented sauces with lots of spices and herbs for best taste. Being Chinese, my definition of salad is not a bowl of raw vegetables. In Asia, hot dishes are preferred but there are some foods meant to be served at room temperature or chilled. They are often appetizers or summer dishes with strong flavours and a mix of cooked and raw, like Malay kerabu, Thai som tam and Chinese liangpi. Like most Singaporeans, I’m not a fan of Western salads so I use Asian condiments and spices with both raw and cooked ingredients. They can be prepared in advance with anything on hand and hence make a great lunchbox (dressing must be kept separate or ingredients will get soggy). Base – My preference is carbohydrates (cooked pasta, noodles, rice) but I know friends who love a bed of leafy greens – why not! Make your own rules. Add softness – My favorites are chestnuts and soft tofu. Well-cooked fluffy legumes and starches are great too. Add protein – Tofu/tempeh/seitan, cooked legumes, nuts and seeds. Add interest – Dried fruits, sauteed mushrooms/garlic, fermented foods, wasabi, pickles, nutritional yeast, vegan cheese, spices and herbs, toasted nuts and seeds. Anything you love to make you feel excited to dig in! Add texture – Hard or crisp veggies (cucumber, bell pepper, carrots), crunchy or juicy fruits (apples, pear, jackfruit). Dressing – Find a balance between sweet, sour, savoury and creamy. Sweet can come from dates, juice and syrups, sour can be from citrus fruit juices and vinegars. Savoury can be from salt or any savoury sauce, and creamy is from nut butters, hummus, avocado, blended silken tofu or non dairy yogurts. Experiment with your favourite combinations by blending or mixing in a bowl for a quick sauce. Top with fresh or dried spices and herbs for extra taste! Cold noodles that needed just 10min cooking. Black rice noodles tossed in soy sauce, vinegar and sesame oil, premade kimchi, toasted tempeh crumbles and raw mint leaves. Anything can be veganized, there are endless online recipes and resources to help you with that. 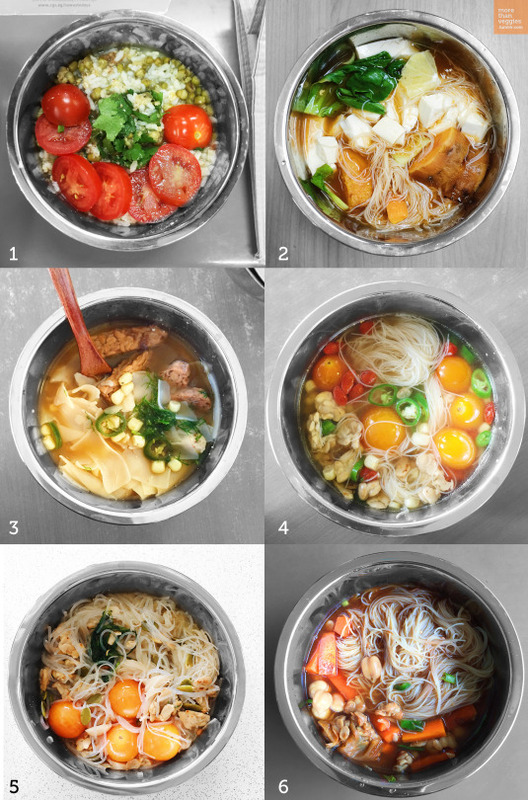 If you want to explore international flavours, here are some recipe apps that can help. basic need isn’t ideal – proven by studies on the rise of chronic diseases related to diet over past centuries. That’s why making good food is an important self-care life skill. Keep trying new ingredients, methods and combinations. Worse thing that can happen (if you remember to turn off the heat) is a bad tasting but still edible meal. Make every meal a contribution to your well-being. Next > buying affordable groceries in our little red dot. Thank you so much for all this information! Much gratitude.